It’s called a “dead cat bounce”. It’s based on the premise that even a dead cat bounces when it slips off a 12th floor balcony and lands on the sidewalk (contrary to popular belief most sky-diving cats aren’t lucky enough to land in a rose bush). This distressing analogy is used in business when share prices, commodity prices, or any measure of corporate performance, blips up and the reason for that blip is unsustainable—a hurricane that temporarily disables petrochemical manufacturing plants in the US Gulf Coast will cause an uptick in commodity prices because supply can’t keep up with demand, but that uptick vaporizes the minute conditions return to normal. 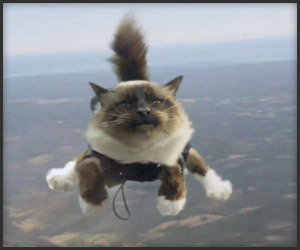 A wise CEO never deludes himself into thinking that the dead cat bounce is real—that poor kitty ain’t going anywhere–he looks for the real story elsewhere. Okay with the image of a dead cat firmly in mind, let’s turn to the Leger survey commissioned by the Calgary Herald* You know where this is leading, don’t you? Leger surveyed 1,208 Albertans between Sept 11 and 17. The survey had a margin of error of plus or minus 2.8% (which means absolutely nothing to me. I took basic statistics twice and still can’t remember the difference between the mean, median and that other thing). So what did the statistically-challenged learn from this data? That 1,208 Albertans like Ms Redford a little more than Dr Sherman and Mr Mason but a lot less than Ms Smith. Oh and kudos to Ms Redford’s PR guys, those teary eyed photo ops with flood victims paid off. Leger continues. If an election were held tomorrow the Wildrose would capture 34% of the vote, the PCs 33% and the NDP and the Liberals each 15%. This means that either the WR or the PCs would win and the NDP and Liberals would lose. What does all this mean? Absolutely nothing. The Herald describes the Leger poll “the first major poll” since the flood. This is utter nonsense. It’s nothing more than a pulse check, and guess what, there are at least four parties charging down the track in a horse race that isn’t even half over. Instead of wasting our time with superficial surveys conducted by “for-profit” corporations who do market research for anyone from Blackberry to Walt Disney (I wonder whether Leger will remove Blackberry from its list of “prestigious clients” when BB completes its death spiral) it would be more helpful to engage a thoughtful pollster, someone like Michael Adams for example. Mr Adams is a pollster and founder of the Environics Institute, a non-profit organization engaged in research related to public policy and social change. He also wrote Fire and Ice: The United States, Canada and the Myth of Converging Values which demonstrated, much to my relief, that contrary to popular belief Canada was not turning into the US. Hear! Hear! Engaged Albertans aren’t interested in which politician is the most “likeable”. They want to know more about the values that guide our government. Are Albertans prepared to fight for universal healthcare or do they believe that healthcare is a privilege and those who can afford it, earned the right to jump the queue? Are Albertans prepared to risk the environment (and if so how much) in order to develop the oil sands? What is an acceptable baseline for primary, secondary and post secondary education? To paraphrase Mr Adams, thoughtful people are not just curious about the world, they are curious about themselves. We want to know who we are as a society and what we’re becoming. Intelligent pollsters can play a vital role in helping us understand these issues. If nothing else the progressives want to know that they’re not alone! So this is a long winded way of telling you media types that if you’re going to publish a full page analysis of poll results under the banner Inside Politics you need to do a lot better than reciting a few numbers from a pollster who in the last provincial election got the percentages right but the parties wrong, and fluffing it up with a few quotes from local political scientists who summarize the poll results by saying that despite the issues facing the government “…the Tories aren’t losing ground”. Hand me that dead cat will you, it’s time to smack someone upside the head. This entry was posted in Politics and Government and tagged Brian Mason, Danielle Smith, Environics, Leger Poll Sept 2013, Michael Adams, Raj Sherman, Redford. Bookmark the permalink. Well Susan I dont think I agree with you on thinking engaged albertans want to know what values guide our Gov’t. as can be demonstrated by there results in the ballot boxes for the last 40 years. I know a politician who only ran one term because he didnt like what he saw after he was elected and didnt wish to continue in that life style. Most voters think “better to vote for the devil I know than the one I don’t”. Everyone knows that politics is a blood sport and Alison has proofed she is very adept at it and the one thing that irritates me that she is emasculating all the males in the party except her right hand man and I don’t know but he may be a cross dresser and merits special attention. And are Albertans willing to risk the environment over the development of the tar sands, I say yes which in some instances has proved itself already. And the media and polsters play the same game (tell the public what they want to hear) so that it benifits there bottom line. Polls, schmolls. I’m not convinced polls ever fulfill the function of which Adams speaks. Let’s have more “persuasive prose” period — you know, more posts like this one — but sans the call for violence. OK, no more bouncing dead cats! Interesting observation Tom. Is a voter who defaults to “the devil I know” really an engaged voter or simply lazy or frightened? I have no issue with a voter who weighs all the alternatives and decides that “all in” he prefers the PCs (I don’t get it, but this is a democracy, albeit a difficult one with the first past the post system). However the voters who put their brains on ice and simply vote PC because that’s what they’ve always done or vote against the Liberals or NDP or a new party because they’re afraid of the party label, are doing us all a big disservice. I assume this is the same Leger corporation that is running the task force on teacher excellence. F’ing amazing, this Redford government! https://legerweb.com/TeachingExcellence/ They must all be exhausted jumping from bed to bed and trying to keep everything under the covers. Linda, I don’t know whether the the two Leger organizations are connected, but I did note that the Leger website describes its new Leger 360 approach and the email links in the task force on teacher excellence both end with @leger360.com. Could be a coincidence but I’m betting not. The Herald also hired Leger to conduct a poll on the queue-jumping inquiry. Leger polled 1,208 Albertans (exactly the same number as the political leadership poll, fancy that). 76% thought the inquiry wasn’t a good use of taxpayers’ money (as compared to what, centralizing all healthservices under one umbrella organization only to take it all apart again and paying out millions in severance in the process?) and 54% thought the inquiry didn’t get “to the bottom” of the issue (which “issue” would that be, the ones like wait times and physician bullying that Ms Redford pulled off the table?) All this demonstrates once again that Arts Squared is right, these polls are utterly useless. Well the Horners I am familiar with Hugh or Jack would not have tolerated a x-dresser in the family and super uke’s family I know nothing about. Right-o, well, we’ll it there then. Thanks Tom. I smiled when I read the comment about “Polls, schmols.” It seems the press likes to sink its teeth into something like these “rigorous and scientific examinations” of our citizenry as it can pontificate without masticating. There appears to be no media engagement as to the nature of the original poll question and whether it is misleading, who funded the research with a specific objective in mind or other typical flaws associated with polls. But the reporter can crank out some easy column inches without using too many brain cells. The second flaw could appear if the reporter wants to be more daring, by attempting to put some interpretive spin on the results. For example, if the reporter was aligned with the Wildrose, the spin could have produced very different headlines. The reporter could start with the premise that the PC’s have gerrymandered the voting districts to empower the rural vote over many years. This could lead to different conclusions as to how those votes might play out in terms of elected seats. Wildrose presently shows its strength in these areas and with a 34% support, it could form a majority government if an election was held tomorrow. You may recall the PC’s did that in 2012 with numbers that did not match the actual seats won. Some people suggested that one rural vote was the same as two urban votes after that election. That would produce a very different headline than Alison improving her likability scores. So now we have a potentially flawed survey interpreted by a biased and perhaps either lazy or harried writer that can influence the unengaged. So if we can’t get the media to chew on the material with some sense of intellectual curiosity, at least we should rename this form of journalism to schmolism. Roy, between you and Arts Squared you’ve added two wonderful new words to our lexicon: “schmolls” and “schmolism”. Both are bang on. You made a good point that part of the problem could be that the journalist is harried and exhausted from trying to keep up with the demands of media bosses who demand “fresh” stories 24/7 and don’t give their reporters the time or the mentoring to develop into true investigative reporters. I was talking to an investigative reporter the other day. This fellow was digging deep to get to the bottom of a complex story which might involve corruption at a number of levels, however I didn’t get the impression that he had a lot of resources to draw on. He deserved credit for sticking with the story, I doubt that many others would have the same tenacity. So it all comes back to where we started–democracy requires an engaged public, an engaged public requires good unbiased information and analysis. Schmolls and schmolism just doesn’t cut it. By the definition you offered, Alberta politics is a dead cat that cannot bounce. I ask the question who paid for that poll? Once I know that I will do my interpretation within 2.8%, which means some people are fatter than others so we have to take that into account. Rome is on fire and the Emperor is playing the violin. We are bombarded with this crap and we should all request that polls to be allowed in moderation. Furthermore experts should only be reported when invited. I prefer more Snowdens and less of this useless information that takes us nowhere. One day chocolate is good, the next day is a carcinogenic. Alchool is good depending on the grape harvest that year. So Alison’s reputation is going up!! Ok I agree with Susan it is all the photos of her caring for the flood victims and all the reports how well she is doing in China where she just threw out another 60 thousand dollars. The equivalent of another 2400 baths that could be offered to our seniors. As far as Michael Adams I do not know him and I read ‘Fire and Ice’ which I thought it was a bit of repeating the obvious. Canadians and Americans have never been similar except that they control our economy and so we have to fake being close to them. It is obvious to anyone with half a brain that taking Harper’s Church group and the 39% that vote for them, we have a completely different view of social values and political decency. We are not doing very well but that is because lately our Tea party members have been running the show. I think that this idea that Canada and the US are the same is just pathetic really. Carlos, this poll and others on the queue jumping inquiry and the government’s response to the flood were all paid for by the Calgary Herald. The polls were superficial and the analysis provided by the Herald was utterly inadequate. So that lends credence to you, Arts Squared and Roy who’ve all pointed out that polls are virtually useless. The only reason I track them is because they create simple little headlines that sink into the public’s consciousness. That lets the public off the hook. Instead of thinking for themselves, the public is free to conclude that Alison is doing a better job because her popularity is rising, the queue jumping inquiry was a waste of money so let’s not do that again and the government’s handling of the flood was wonderful when it’s becoming obvious that that’s not the case–the High River situation was and continues to be a mess. Given the power of polls to swing public opinion they can’t be ignored. Yesterday the New York Times published an article accusing Harper of wanting to keep Canadians ignorant by being so darn idiotic about muzzling our scientists. Interesting that the federal government wants to “do consultations” before it decides to sign on to the UN Arms Trade Treaty, but was not prepared to consult before it signed the Canada-China (FIPA) free trade deal.